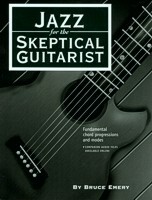 This book proceeds onward from Volume Two, The Fretboard, and presumes that you are up to speed on the first two volumes. 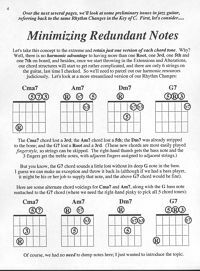 We start out with a description of jazz chords with regard to the Rhythm Changes, voice leading and the spelling of complex chords. 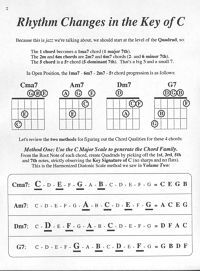 You'll get experience playing two popular progressions of complex chord shapes, what I call the MVP (Most Valuable Progression) and the VIP (Very Important Progression). Other topics include modulation from key to key, comping and mystery chord analysis. 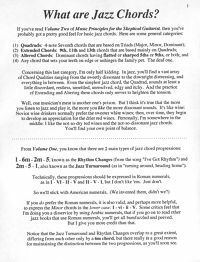 Then comes an introduction to the use of scales and modes in improvising jazz lead lines. 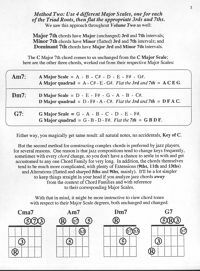 We seek out the C-A-G-E-D scale shapes in the Key of C all around the neck of the guitar.